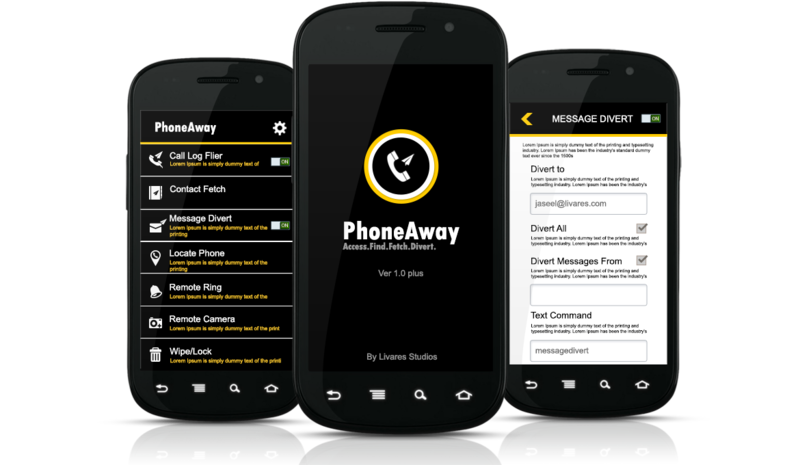 Livares Studios PhoneAway is a utility application available in leading mobile platforms. The app offers an extreme new feature rich experience for users to access their phones remotely. Missed call alert: Get missed call alerts in mail. The PhoneAway MISSED CALL ALERT feature gets you missed call alerts in your mail any alternate mobile(via sms). This once activated through any of the activation methods(manual, sms command, missed calls), continues to fetch and deliver all the new log entries. Contact Fetch: Fetch contacts remotely. The PhoneAway CONTACT FETCH feature lets you fetch any contact in your phonebook remotely. This feature fetch and deliver the contact or a list of contacts to your email or any alternate mobile(via sms). Message Divert: Divert your messages to mail. Through PhoneAway MESSAGE DIVERT feature you can divert all your incoming messages to your e-mail. The feature having a manual and remote command activation also lets you select to divert messages from a set of specific numbers. Remote Ring: Control your ring settings. The PhoneAway REMOTE RING feature lets you control your ring options. This feature make your phone ring loud even in SILENT MODE so that you can find your misplaced silent phone. The SILENT command lets you bring your phone to silent mode remptely. The PhoneAway REMOTE CAMERA feature lets you take pictures using your Front and rear cameras. The Remote Camera command snaps, saves and send photos to your email. The PhoneAway LOCATE PHONE feature lets you track the location of your phone. PhoneAway shows your phone’s current location in map. Through PhoneAway WIPE feature you can delete all the contents in your SD card or initiate a factory reset of your device remotely. The LOCK feature can be used to lock your phone remotely. Theft Settings: Performs a set of actions in case of theft. Theft is a special single command feature that performs a set of preset actions like Front cam pic, Locate, Wipe, Lock etc. Store: PhoneAway now available for Android. Perfomance advantages of PhoneAway plus. Evolved from the beta version; when we named it a plus, we meant it in all means. The PhoneAway plus version brings you more on perfomance with improved UI, better power usage, security etc. Copyright © 2014 PhoneAway. Made with love in India by Livares Technologies. We are Passionate in innovating something. For us Innovation means finding the gaps and customer issues in the current market then addressing those issues.